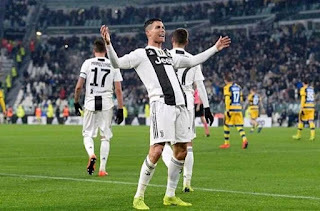 Juventus star Cristiano Ronaldo is set to miss his club's next two games at a minimum after hitting a hamstring injury, with his status of play for their Champions League quarter-final first leg against Ajax a doubt for the Portuguese international. The forward came off the pitch with a hamstring problem during Portugal's 1-1 Euro 2020 qualification draw with Serbia on Monday after 30 minutes. "I'm not worried, because I know my body perfectly." Who's out there risks it. I'm calm, because I know I'm going to be back well in one or two weeks with no problem." Ronaldo began his treatment on Thursday, as he underwent a physiotherapy for the injury. However, the full extent to Ronaldo's problem is still not known, leaving his status for Juventus' upcoming matches uncertain as no further tests are planned for Thursday.